In my earlier post on the 2828 Café Famous Beef Koay Teow Soup stall, I did mention about the dinner spread you can get from the same café. If you are one who can appreciate authentic Chinese dishes, you had come to the right place as the dishes served here are a mixture of Cantonese and Hakka. Not only are the dishes here are having the taste of a family dinner spread, the pricing here would definitely please those with a big household. The stall here is none other than Kim Hooi Seafood which has been operating in the present premises for over 7 years. On top of those common dishes you can get in any stir-fry dishes restaurant, this place had the extras effort to introduce their specialties daily. Here was one of the dishes. It’s Braised Pork Ribs with Radish (RM7). Choice pieces of pork ribs were marinated with red fermented bean curd (nam yu/tau joo/乳腐), fried and then braised with some chopped radish and chilies. Initially I thought this was another Hakka dish but eventually I was told that it was also called Thai Ribs (泰骨). The taste was remarkably unique and the ribs were tender and melted in my mouth. 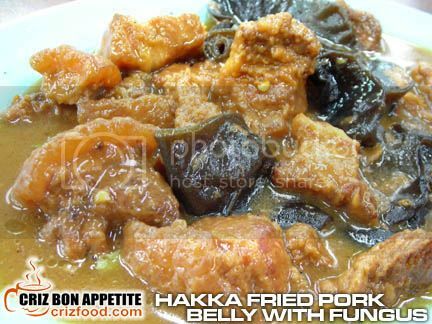 The next special dish was indeed Hakka. It was the Hakka Fried Pork Belly with Wood Ear Fungus (客家炸肉-RM7). The method of preparation was somewhat like the pork ribs except that the gravy had a stronger red fermented bean curd taste. This dish would be best with a hot steaming bowl of rice. 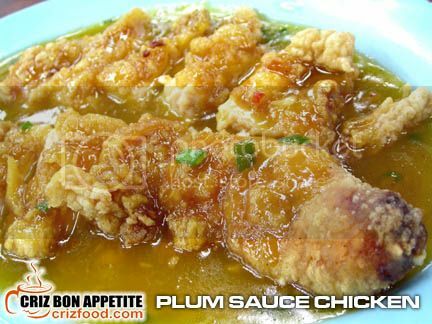 If you do not want to have so much of pork dishes, the Plum Sauce Chicken (梅子雞-RM7) would be quite ideal, even for kids. Although there was the presence of some chopped chilies, the dish was not spicy at all. One whole boneless chicken drumstick was coated with some batter, deep fried, topped with some hot boiling plum sauce with chopped chilies and garnished with some chopped spring onions. Not only was the chicken slices crispy, the gravy itself was enough to boost up my appetite. I found that there was something in there that made the dish different compared to others. It had some chopped pickled ginger added. No wonder the dish was so delicious. 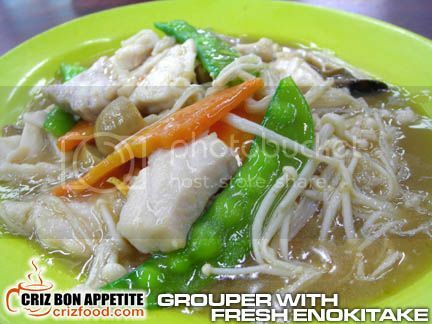 As for seafood, the next dish which was the Stir Fry Grouper Fish Fillet with Fresh Enokitake (金針菇石斑魚片-RM15) was wonderful. The fillets were indeed fresh. Together with the rest of the ingredients which included sliced carrots, button mushroom, snow peas, enokitake (enoki mushroom/golden needle mushroom/金針菇) with a dash of Shao Xing wine, the whole dish was healthy and hearty. Moreover, I found that the amount of grouper fillets given was rather generous. 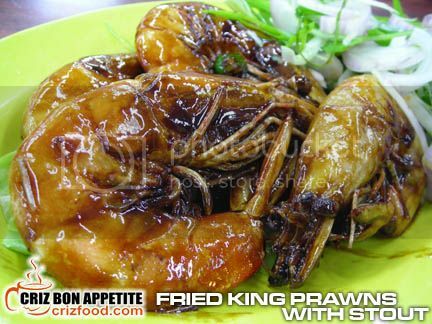 The next dish was rather interesting – Fried King Prawns with Stout (黑啤酒蝦 – RM18). Four king size white prawns were deep fried and then stirred into some thickened stout beer with a soft touch of salt and chopped chilies. It had lots of sliced spring onions and big onions as salads. The sweetness from the stout blended in nicely with the salads. The prawns were so fresh that I had some trouble peeling off the skins. Although I love this dish a lot, the only hiccup I had was on the preparation. The prawns should have been slightly sliced at the side prior to cooking to allow the delicious gravy to seep into the flesh. 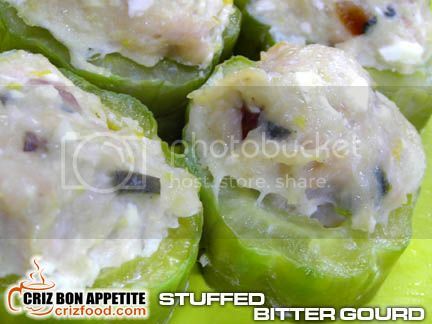 For those who love bitter gourd, the next specialty would be great – Stuffed Bitter Gourd (RM8-4pcs/RM12-6pcs). Each slice of bitter gourd was stuffed with the chef’s own recipe which included fish paste, minced pork, chopped salted and century eggs. These stuffed bitter gourd slices would then be steamed for a period of time before being topped with some oyster sauce based gravy. For those who love to have same tofu dishes, this place served the best house special tofu I had tasted. The tofu slices were silky smooth and they just melt in your mouth. Although I could order other types tofu such as Japanese tofu which would also be available, I rather have their house special tofu which were preservative-free. 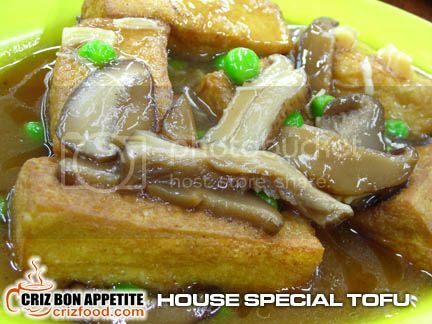 One way of cooking the House Special Tofu (招牌豆腐 – RM6) would be in some mild gravy accompanied with some sliced Chinese mushrooms, peas, dried scallops and a touch of Shao Xing wine. Delicious! 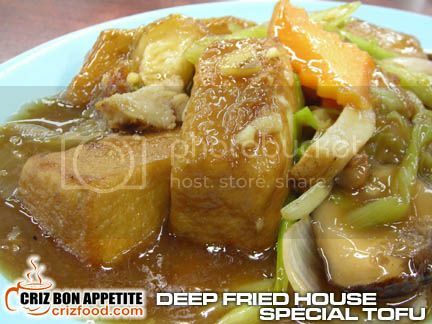 Another version would be the Deep Fried House Special Tofu (紅燒招牌豆腐 – RM7). This dish may look quite similar to the earlier one but the gravy had a stronger taste due to the usage of some sliced carrot, leek, roasted pork, garlic and of course the Shao Xing wine. This is another great dish to go with rice. 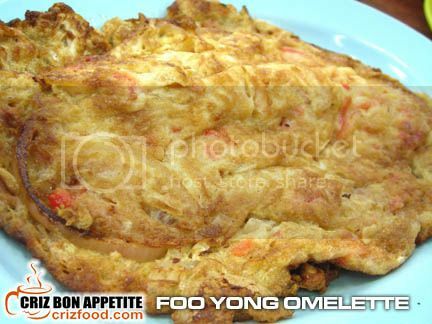 When you have kids around, one of the common dish you might order would be the Foo Yong Omelette (RM5). There’s nothing special about this dish as it only contained eggs, sliced onions, chopped grilled pork (char siew) with a touch of flavorings. 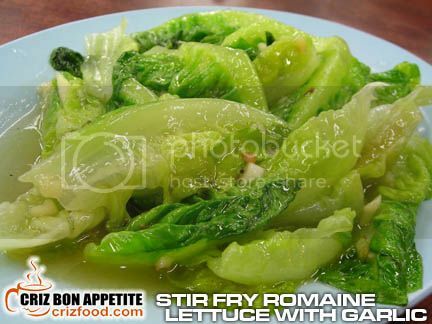 There were so many types of fresh vegetable dishes available here but I always like to have something simple such as the Stir Fry Romaine Lettuce with Garlic (RM5). What I like most about their preparation was the maintaining of the crunchiness of the lettuce. It was simple yet healthy! 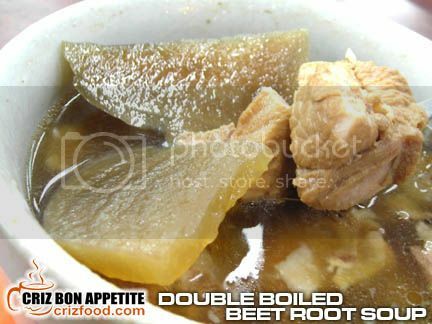 For those soup lovers, you should try out their daily double boiled soups other than their impromptu cooked soups. They should have at least two types available daily. 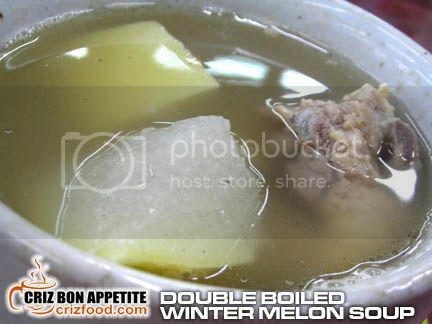 I managed to try out their Double Boiled Winter Melon Soup (冬瓜湯 – RM5.50). I thought it would be just a simple bowl of soup but I was wrong. The thick and aromatic bowl of soup contained lots of meaty pork ribs, red dates, dried mussels and winter melon cubes. I did not regret ordering this bowl of soup. Overall, this would be a great place to dine in after you are bored with all those restaurant/hawker/fast food. After all, we should also have some healthy meals from time to time right? 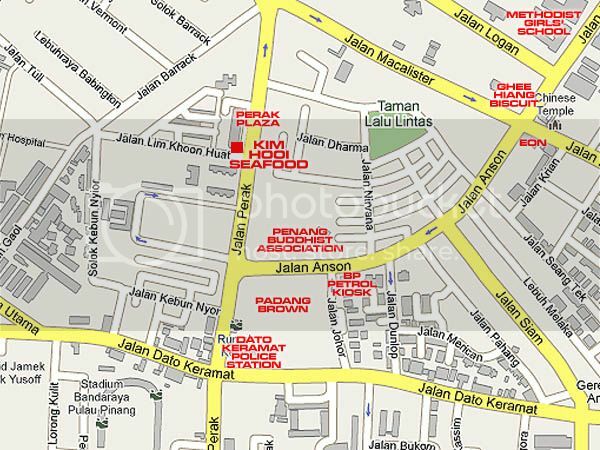 It’s easy to find the stall as it is located at a corner lot of Perak Plaza, Jalan Perak. The easiest way to reach the place from town would be by using Jalan Macalister (as you would not be able to turn right from Jalan Dato Keramat). Drive all the way until you see the Jalan Macalister/Jalan Anson traffic lights (EON Automobile Showroom on your left). Turn left into Jalan Anson and drive all the way until you see the Jalan Anson/Jalan Perak T-junction traffic lights. Turn right into Jalan Perak and keep left. You can see the corner café immediately after a stretch of the General Hospital Officers’ residence on your left. Turn left into Jalan Lim Khoon Huat and park your car along the service road in front of the Perak Plaza. Address: 56K, Perak Plaza, Jalan Perak, 10460 Penang, Malaysia. SHABU SHABU ON A RAINY DAY? Definitely must try for me! Thanks for the recommendation. 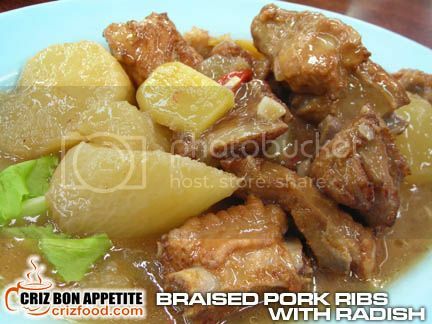 I like to go for the braised pork ribs with radish…it is not easily found elsewhere. Speaking about that… I don’t think I had seen anyone here selling this dish at all. The stuffed bitter gourd is stunning. I enjoyed the Thai version too with coriander roots soup base. so affordable and such homely preparations! What LOL?? Won’t that be ideal for family dining?? Braised Pork Ribs with radish get my attention here …… I had this before cooked by my fren’s grandma …..
great food-cheap, too-like the braised pork ribs with radish. Wow! You too love this dish?? Cool!